Comprehensive review of Jergens Natural Glow Daily Moisturizer. See what the experts and actual users have to say about this self tanning product. Jergens Natural Glow was somewhat disappointing as a self tanner, I must say. I have heard that it is popular among a lot of people and was looking forward to trying it out. The color is very subtle, and we even used the darkest shade available. It’s meant to be applied as a lotion that you incorporate into your daily routine…unlike most self tanners that you can use once a week and see a drastic color change. This product could work well for people who use it as a lotion first with the added value of a very, very subtle color tint. I could also see this product being a good fit for the much older demographic who are sensitive to sunlight. We gave Jergens Natural Glow a rank of 2.5/5. Which put it about average among other self tanning products. 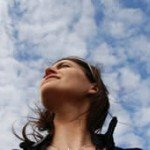 I used gloves to apply Jergens Natural Glow but could have done without them. It squeezes out as a “white-colored” lotion. It’s not thick like a cream, but does have a moisturizer feel. 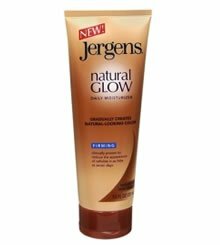 Jergens Natural Glow is similar to the consistency of a lotion that you would use daily. It did not leave any discoloration on my gloves. Jergens Natural Glow is definitely a lotion first, tanner second. It applies and rubs in like your typical night time body lotion. Thankfully, it did not leave any streaks or obvious lines. But, the color did seem to cling to the areas where my joints bend (i.e. toes, elbows, and knees). It’s not a noticeable color difference to the naked eye, but because I was the one applying it, I did notice the color blotching a little. I found that this product dries very fast. However, you may feel a little sticky for another 10 minutes until the product has completely soaked in. I did not notice any specific smell to Jergens Natural Glow right away or for the first couple of hours. It wasn’t until about three hours after I applied Jergens Natural Glow that I noticed a coconut smell was following me around. And then I realized… it was me! Personally, I am not fond of the smell. Although it doesn’t have the distinct self tan odor, there was an oaky-coconut scent that I did not like. When I woke up and showered, for the first time after application, the smell was completely gone. However, this product is meant to be used every day, so the smell will never go away. Even as the darkest shade of the Jergens Natural Glow available, it still produced one of the lightest “tans” we’ve ever seen. After three days of application there was no drastic change in color. I guess my skin did have a nice glow to it and was maybe one shade darker, but the transition was subtle. Like I said earlier, the color did seem to cling to my joints where my limbs bent (i.e. toes, knees, elbows). If used as a typical self tanner (once a week) the life expectancy of your Jergens Natural Glow tan would be about 1 day. If used as a daily moisturizer your tan will last as long as you continue using it. This product will work well for men who do not want a noticeable, same day tan. However, because the smell comes back every time it is applied (every day) it could be a turn off for most men. Jergens Natural Glow costs $8.49 for a 7.5 ounce tube. Making it one of the cheaper products out there. 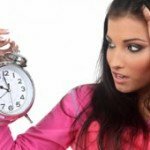 But it’s not necessarily the best bang for your buck because you will need to use it every day to achieve the sunless tan that you are looking for.